Donald 'Joe' Gribble passed away peacefully, after a lengthy illness, at his Highgate Farm home in Molalla, Ore., on December 30, 2016. He was 85. He was born to Andrew W. Gribble and Iness Knox Gribble in Clackamas, Ore., on June 4, 1931. He graduated from Molalla High School and OSU with a B.S. in Agricultural Engineering. Joe and Joann (Freeman) Gribble were married in 1954 at Smyrna Church in Yoder, Ore. Joe was discharged from Fort Rucker, Ala. in 1960, as a Lieutenant Army Flight Instructor. He soon began Gribble Construction with his father in Port Orford, Ore., moving in 1962 with the business, now Agpro, Inc., to Santa Rosa, Calif., Hixson, Tenn., and Paris, Texas. He lived his final 30 years in Oregon, with Joann at Highgate Farm. He was the President of Agpro, a recognized expert in cutting edge animal waste management equipment and modern farm design engineering across the U.S.A. and internationally, until 2006. His two sons, Ted and Donald Gribble, and their wives, Sherri and Dana, joined Joe in the business in the 1990's. The engineering design was moved to Five-G ­Consulting, Inc. Five-G and Agpro are now in Paris, Texas. Joe was active at Smyrna United Church of Chirst, Gribble Pioneer Cemetery Board, and Gribble Pioneer Heritage Corp., a nonprofit to preserve the "Gribble Barn" (on the Canby Marquam Highway) on the original Gribble land claim homesteaded in 1846. Joe remained an avid and skilled pilot, until his last flight in the cockpit of a boat plane, over Lake Coeur d'Alene, Idaho in 2012. Joe was greatly respected and loved, especially for his humor, as a husband, father, father-in-law, uncle, grand­father and employer by those he left behind. 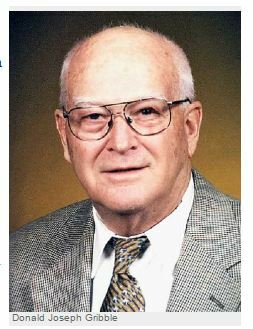 He is survived by his wife, Joann; daughter, Patricia (Rodney) Rice, of Molalla; sons, Donald (Dana) Gribble and Ted (Sherri) Gribble and grandsons, Alexander and George, of Paris, Texas; grandchildren, Victoria (Andres) DelValle and David (Kelley) Gribble and great-grand­children, Elijah and Chloe, of Tulsa, Okla.; grandson, Davin Gribble Johnson, of Olympia, Wash.; grandson, Nathaniel Gribble Blair of Rochester, N.Y.; older brother, Andrew W. (Ingrid) Gribble, of Kansas City, Kan.; nephew, Andy "Burli" and niece, Andrea of Alexandria, Va.; younger brother, Tom (Emily) Gribble, of Highgate Farm in Blue Ridge, Texas; nieces Cathy, Sheryl and Lorena, of Tucson, Ariz.; Yoder family nieces and nephews, Jim, Vernon and David of Yoder/Molalla, Ore., Beverly, of Newberg, Ore., Judy, of Sun River, Ore. and Mary of Redmond, Ore. The family gives deepest thanks to the Providence Hospice staff and Home Instead caregivers for their dedicated care of Joe in his final months. Services will be on March 4, 2017, with a 10 a.m. internment of ashes at Gribble Pioneer Cemetery, on Gribble Rd. (near Primrose Path), Canby, Ore.; a memorial service at Smyrna Church, 31119 S. Canby-Marquam Hwy (Hwy. 170) at 11 a.m.; followed by a celebration of Joe's life and a light lunch in the Smyrna Church Fellowship Hall. In lieu of flowers, the family requests contributions to Smyrna UCC Memorial Fund, at the address above, or to a charity of your choice. Questions may be directed to Patricia Rice at Highgate Farm, 503-829-4844. Donald Joseph "Joe" Gribble passed away peacefully, after a lengthy illness, at his Highgate Farm homein Molalla, on December 30, 2016. He was 85. He was born to Andrew and Iness (Knox) Gribble 1931 in Clackamas, Oregon on June 4. Services will be held on March 4, 2017. A full obituary will be in the January 25, 2017 edition of the Molalla Pioneer.